So many people have been enjoying my Melty Stretchy Gooey Vegan Mozzarella recipe for years. It’s a fan favourite with almost 150 thousand shares and over 800 comments. Woah! But there were two questions about that vegan mozzarella that I’ve received over and over again that I wanted to answer with a brand new recipe. Is there a way to make this vegan mozzarella nut free? Is there a way to make this cheese firm so I can grate it? I’m happy to report that I was able to solve both of those problems, which is why I dub this recipe, The Best Vegan Mozzarella!!! It takes about 5 minutes to make. That’s it! Then just pop it in the fridge to chill and set. SO easy peasy. It requires only 9 ingredients… and one of them is water! 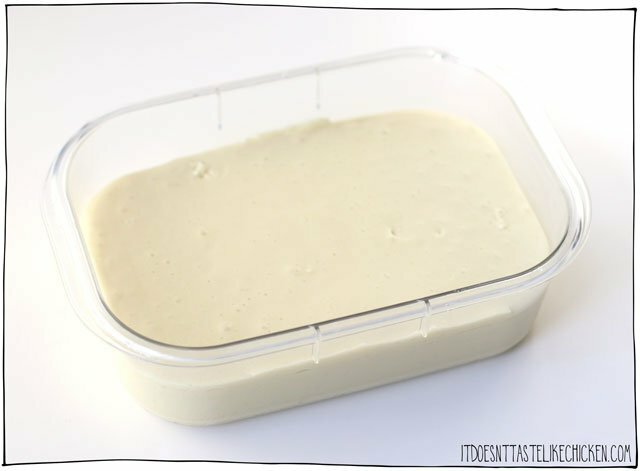 It can be made ahead of time and stored in the fridge so grateable vegan mozzarella will be at the ready! 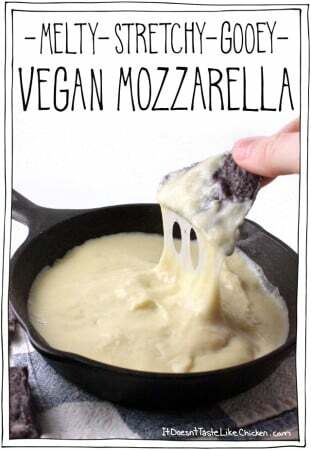 It melts wonderfully, better than most store-bought vegan mozzarellas. It tastes super creamy cheesy gloriously delicious. It’s 100% nut-free, gluten-free, dairy-free, and of course vegan. See, it really is the best! For the firming agent in this vegan mozzarella recipe, I provide you with two different options and they yield very different results. Kappa Carrageenan (I ordered mine on amazon here), is a powder derived from seaweed. Using kappa carrageenan in this recipe is easier and results in a creamier meltier cheese texture so it’s my preference. Some people are concerned about the health effects of kappa carrageenan but according to nutritionfacts.org, the science isn’t there yet. Popular vegan brands such as Follow Your Heart use it in their products and they provided this article about it stating that as long as it’s food grade carrageenan, it is safe to cosume. So for me, I’m 100% cool about using it, but if you’d prefer to avoid it, I wanted to provide you with another choice. Agar- also called agar agar (I ordered mine on amazon here), is also a powder derived from seaweed. It takes slightly more work to use, but the real difference is in the finished mozzarella. You can see from the photo below that it doesn’t melt as well, and the taste is ever so slightly less delicious when compared to the kappa carrageenan version. That said, if I didn’t have the two side by side, I would have been totally happy with the results using agar. I also found that when you add toppings over the cheese, I got a little meltier and creamier. Or if you were making a different type of recipe, the cheese gets very melty in the microwave. For both of these, it’s important to note that this vegan mozzarella recipe is intended to be grated or sliced, and then melted. While the cheese is totally edible sliced cold from the block, neither the kappa carrageenan or the agar provided a texture close to traditional cheese, so it isn’t my favourite for snacking. But if you’re into the texture, by all means, snack away!! My favourite cheese for snacking is my cranberry and thyme vegan cheese ball. Now lastly, before we get into the method I wanted to breakdown some of the other ingredients in this recipe. You know I’m all about using easy-to-find ingredients in my recipes, but this vegan mozzarella recipe requires a lot of tricks- it needs to turn into a firm block of cheese, it needs to be grateable, it needs to melt, and get stretchy so this recipe required some special ingredients you might not find in your local grocery store, while other ingredients should be easy to find. 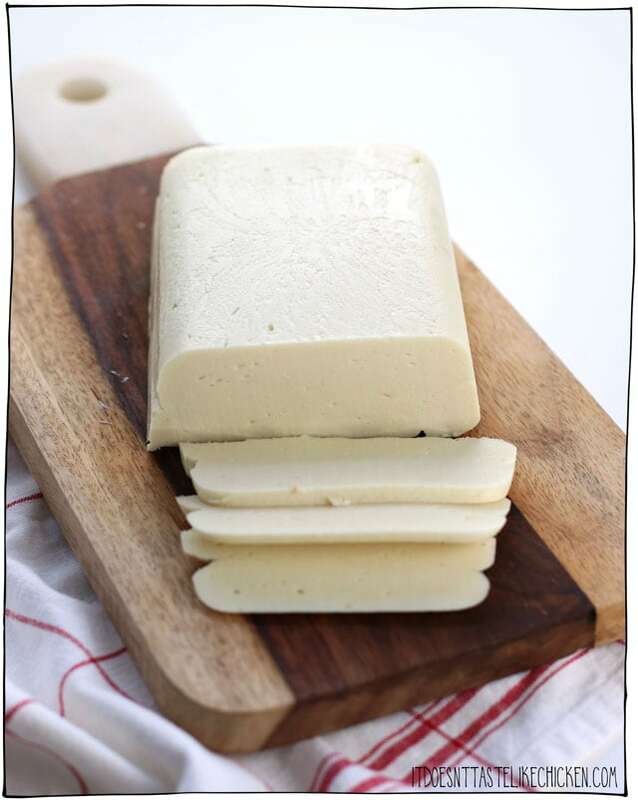 Soft tofu provides creaminess while keeping the cheese light and nut-free. Coconut oil has the unique quality of being solid at room temperature but melts very easily which helps with the firming and melting of this cheese. I recommend refined coconut oil which is flavourless as opposed to unrefined which will add a coconut taste. Tapioca starch (also called tapioca flour) provides the stretchy texture to the cheese. You can sub another starch if preferred but the resulting mozzarella will not have the stretchy texture. Nutritional yeast is a non-active yeast which provides a cheesy flavour. Sauerkraut, yep, regular old sauerkraut is my secret ingredient hack for instantly providing an aged fermented flavour to the cheese. Check to make sure the sauerkraut is vegan (some of them contain meat bits). If you want to experiment you can sub sauerkraut for equal amounts of the brine from a jar of green olives or white miso paste for other great aged flavours. 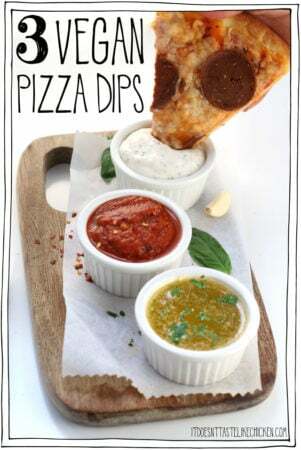 To make the best vegan mozzarella: if you are using kappa carrageenan, simply add everything to a blender, combine until smooth, and pour into a mold to set. BOOM! It’s that easy. Kappa carrageenan must reach 158F to set. Because of this, it’s very important that the water is at a full boil, that you add it to the blender last, and that you blend right away to ensure that nothing cools down. If using agar it takes a little more effort to make the agar set properly, so add everything to the blender except for water and the agar. Whisk together the water and agar in a small pot and bring to a boil over medium heat while continuing to whisk until the mixture thickens and forms a gel. 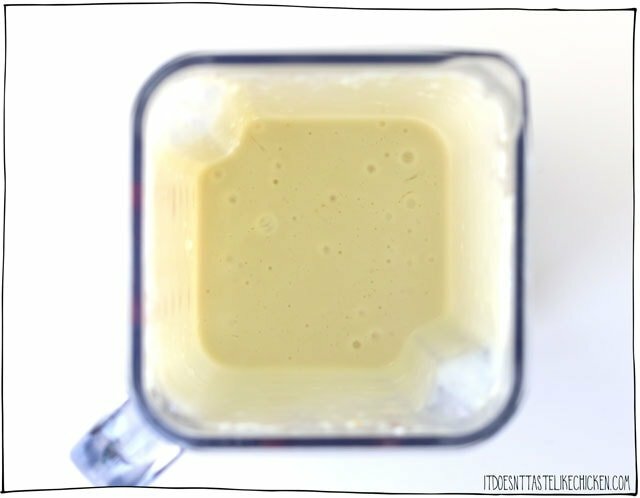 Working quickly, add the agar mixture to the blender along with the rest of the ingredients, and blend until smooth. Pour into a mold to set. Done! Chill, uncovered in the fridge for about 1 hour or until the cheese sets and is firm all the way through. To remove the cheese just turn the mold over onto a clean surface and smack the bottom and sides a few times until it releases. Keep the chilled and set cheese in an air-tight container in the fridge for up to a week. Use anywhere you desire! On pizza, in lasagna, garnish hot soups, to make grilled cheeses, the options are endles. 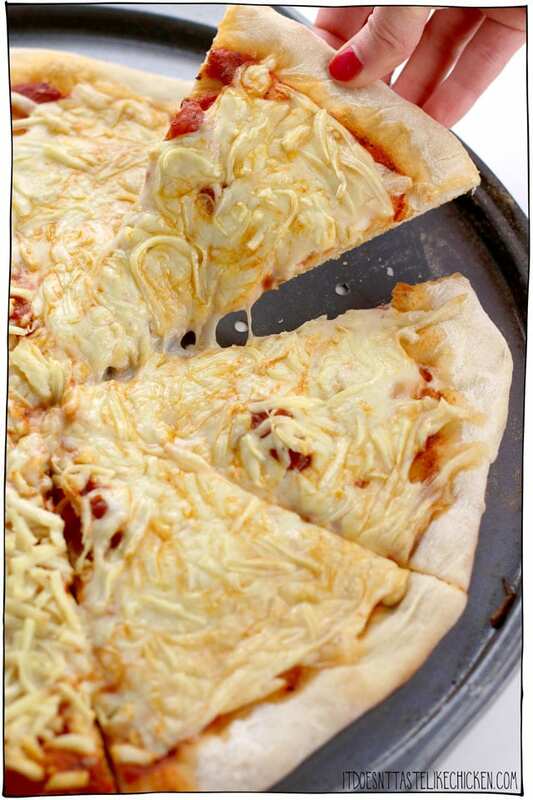 5 minutes and only 9 ingredients to make dairy-free mozzarella that is perfect for your pizza! It grates, melts, stretches and tastes super delicious. 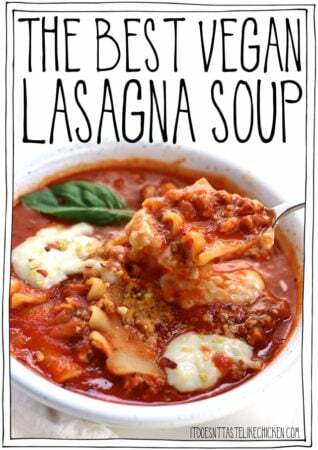 Perfect for lasagna, pizza, soups, grilled cheese, the options are endless. This recipe goes quickly so be sure to read all of the instructions before you begin. Method adapted from Vegan Blueberry. Flavours adapted from my mozzarella in Fuss-Free Vegan cookbook. Add all of the ingredients to the blender, and blend until completely smooth and creamy. Kappa carrageenan must reach 158F to set. Because of this, it's very important that the water is at a full boil, that you add it to the blender last, and that you blend right away to ensure that nothing cools down. Quickly pour into your mold of choice, the cheese sets very fast so work quickly. Chill, uncovered in the fridge for about 1 hour or until the cheese sets and is firm all the way through. To remove the cheese just turn the mold over onto a clean surface and smack the bottom and sides a few times until it releases. 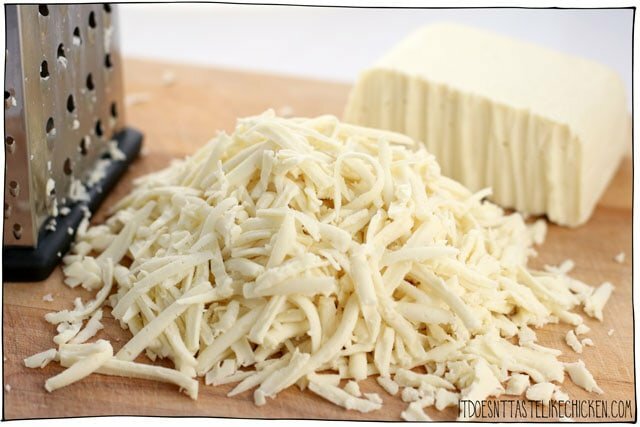 Store the cheese in an air-tight container in the fridge up to 1 week, or it can be frozen. Add everything to the blender except for water and the agar. Set the blender aside. Whisk together 1 1/2 cups cold water and 2 tablespoons agar in a small pot and bring to a boil over medium heat while continuing to whisk until the mixture thickens and forms a thin gel, about 1 - 2 minutes at a full boil. Working quickly, now add the agar mixture to the blender and blend until smooth. Quickly pour into your mold of choice, the cheese sets very fast so work quickly. For the mold, you just need a container that holds 2 cups or more. You can use a small baking dish, a silicone mold, or even just a bowl as a mold to make this cheese. I used a glass storage container like this one to make mine. 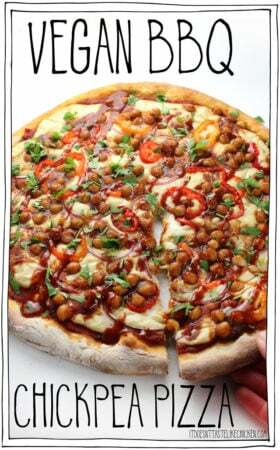 Previous Post: « 25 of the Best Vegan Pizza Recipes! 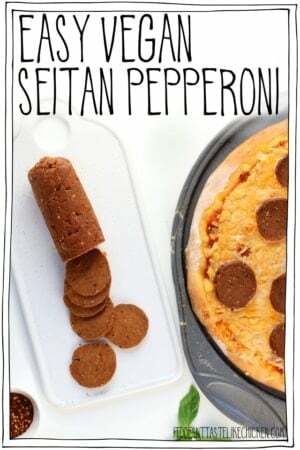 Made it tonight and used it on pizza along with your Seitan pepperoni. Amazing. Gooey and delicious. And so easy to make. So much easier and tastier than another vegan mozzarella I had previously tried. Definite do over! I bow on the altar of kappa carrageenan! 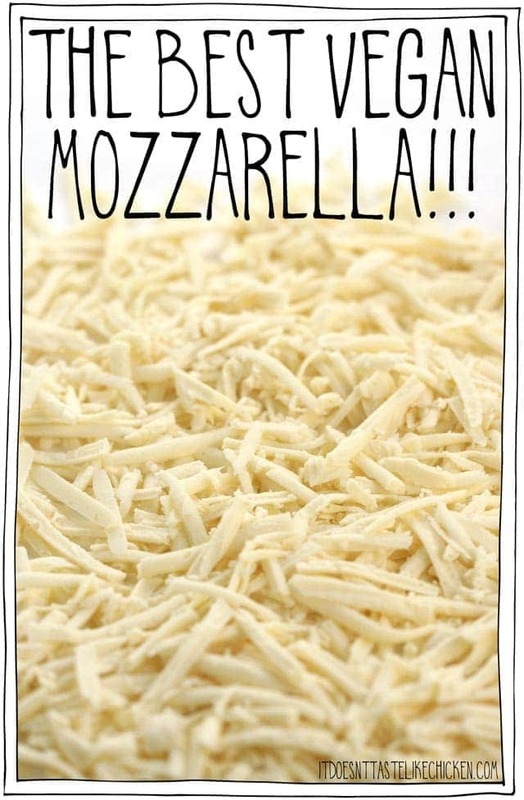 This stuff really makes the mozzarella set quickly and the texture is perfect – grates as well as the real thing. Another winner Sam! Easy to make and firmed up nicely! Love that you can easily grate it. My only issue is that it has a strong coconut flavor. Have you tried making it with other oils? Glad you enjoyed it, Corine. That’s why I recommend using refined coconut oil (as opposed to virgin coconut oil). Refined coconut oil is flavourless, whereas virgin coconut oil has a strong coconut taste. Hope that helps! I’m not sure what I did wrong. My cheese didn’t firm up enough to shred. I used the Kappa method. I did notice in the instructrions that you say to refridgerate uncovered. I covered mine, maybe that is the problem. Oh well, it was still delicious on my pizza. Hi Terrie, no the covering shouldn’t be the problem, it should start setting immediately when you pour it out of the blender. Did you make sure to have your water at a rolling boil, add it last, and blend very quickly? The kappa carrageenan needs to reach 158F to set so it is important that everything is done quickly so it doesn’t cool. Hope that helps! Made this yesterday using agar, and swapped the tofu for cashews since it’s all I had on hand. It turned out wonderful! My 2 year old was eating it by the chunk (: thanks for the recipe Sam! How many cup of Cashew did you swap with? Made this today and was SUPER excited! However I think maybe I did something wrong? I used the agar method since I already had some on hand and I’m thinking maybe I overcooked the agar? It just seems to be kinda grainy? Other than that though I’m really impressed! 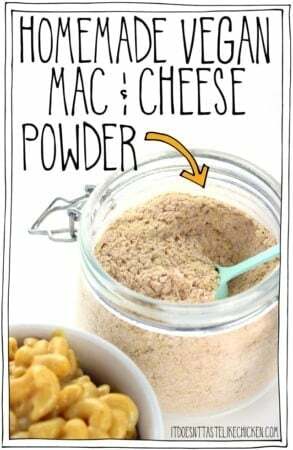 Definitely going to try the karageenan method next time around and maybe even add some smoke flavor and more nutritional yeast to make it kinda Gouda like. I can’t do soy, so although I was initially pleased with the recipe idea, I was subsequently disappointed that you have soy in this. Hi Clare, unfortunately not every recipe will meet everyone’s needs. I was making an option for those who couldn’t enjoy my melty stretchy gooey vegan mozzarella recipe due to nut allergies. In this recipe, you can replace the tofu with equal amounts softened cashews which should solve your problem. I’m so excited for this recipe! 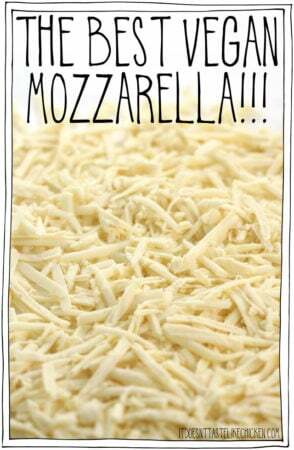 Your first “cheese” recipe has always been my go-to and I have sent it to so many people! I order the secret ingredient as soon as I read this and it should be in today!!!! Now to my question! I plan to make a cheese base I like using potatoes, carrots garlic cashews exc… and now I want to top it with this cheese and bake it! (Sounds amazing right? What would your suggestions be for this? What would I do to make this into a cheddar style “cheese” thanks on advance! Hi Nicole! So happy you are enjoying so many recipes. I haven’t done any recipe testing to make it a cheddar style cheese yet, so I would recommend sticking with the mozzarella as is before trying to experiment with it. Hope that helps! Move over, Daiya and Earth Balance! There’s a new cheese in town and it’s so gooood! I was once a cheese addict and consequently had a hard time committing to being fully vegan because of it…but then I found your blog and tried your cheeses and it filled that cheese filled hole in my heart. ❤️ Making this again and again for tacos, lasagna, pizza, and be still my cheese loving heart – my ultimate fave – the grilled cheese sandwich! Thank you!!!!! if you use a glass container for the mold, should i grease it ? or will the cheese come out ok if ungreased? I want to make this. How do you make the sauerkraut? Do you think we could use corn starch, instead of the tapioca starch in your recipe? Yes, but the tapioca provides the stretchy texture, so it won’t have that. I haven’t tested this yet myself, but I can’t see a reason why you couldn’t… I will give it a try now! How did the freezing go? Do you happen to know what the difference between refined and semi refined Kappa Carrageenan is? I’m not sure I understand it exactly, but I used refined for my cheese. Hope that helps! The tag in the recipe that says “adapted from vegan blueberry” is a link to another blog that made a vegan mozzarella similar to this with cashews. You should be able to combine both recipes in a way to do that! Does the sauerkraut need to be fully drained? Will this work without the oil? Where do you buy kappa carrageenan? No. The coconut oil helps it set and then melt. For an oil-free mozzarella, I recommend my other mozzarella recipe. I ordered my kappa carrageenan online here. I am deathly allergic to nuts so I’ve been looking for a mozz I could master at home. 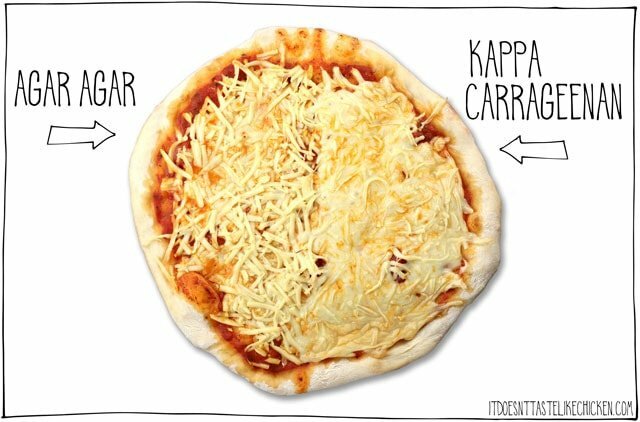 Off to order the Kappa Carageenan! I can’t wait to try this. I don’t use coconut oil due to my high cholesterol. Can I use somerhing else as a substitution? You really need a fat that is solid at room temperature but melts well. So vegetable shortening would also work, but I’m not sure if that will work any better for your needs. Can you use an equal amount of cashews instead of the soft tofu if you wanted to make this soy free? Yes! Cashews should work well in the same amount. Make sure to soften them first by soaking or boiling so they blend well. Enjoy!